Extruded tubes combined with injection molding suspension plugs provides the total package for winding your films, no matter what type. Paragon's unique ability to provide both injeciton molded and extruded plastic products make it the perfect source for film packaging. Extruded cores are available wtih inside diameters up to 8" and wall thicknesses up to .300". Polystyrene is the generally preferred resin due to the stiffness and high crush strength. To complement these cores, Paragon has available suspension plugs in a variety of sizes. Contact our sales office for more information regarding your film core packaging requirements. 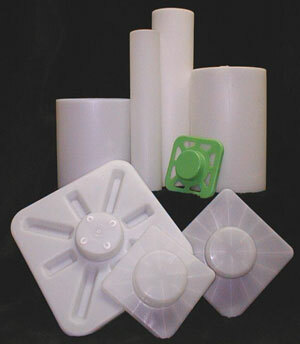 Paragon Plastics, Inc., P.O. Box 100, Union, SC 29379. Tel: 800-233-0714; Fax: 800-789-3878.